Rich Eso reviews the Toho 30cm Series Fire Rodan (東宝30㎝シリ ファイヤーラドン) RIC Exclusive Version vinyl figure by X-Plus. • See more content from Rich at his Fresh Vinyl Reviews YouTube Channel. William Fett of The Godzilla Files reviews the Toho 30cm Series Fire Rodan vinyl figure by X-Plus. This figure is based on Rodan’s powered-up version from the 1993 film Godzilla vs. Mechagodzilla. • See more content from William at his The Godzilla Files YouTube Channel. X-Plus collector Nate Ashby has come up with a solution for making sure your Rodan vinyls don’t topple over. This trick will work with the Large Monster Series Rodan 1956 as well as the 30cm Series and Large Monster Series Rodan 1964. 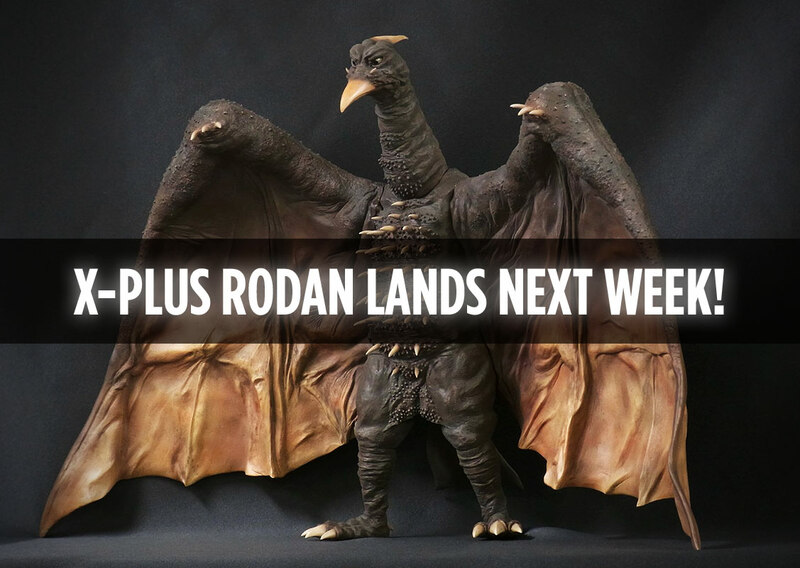 The Toho Large Monster Series Rodan 1964 North American “Diamond” Reissue is arriving in stores this week. (Tuesday-Wednesday). If you are building a 25cm Destroy All Monsters line-up on your shelves, you’ll need this figure as a stand-in for the 1968 version (since a ’68 was never made.) X-Plus themselves have been using this figure in all of their DAM photos. You can also ask the guy at your local comic shop to order item MAR188103. OR, CLICK HERE to order one from Kaiju Addicts and Flossie’s Gifts & Collectibles for $134.99. Today, X-Plus announced the Toho 30cm Series Fire Rodan (東宝30CMシリーズ ファイヤーラドン). This is a high quality, movie accurate vinyl based on the monster’s appearance in Godzilla vs. Mechagodzilla II (1993). Rich Eso reviews the Toho Large Monster Series Rodan 1956 (東宝大怪獣シリーズ ラドン（1956年版）) original release vinyl figure by X-Plus. This figure is getting reissued by X-Plus and is due out this month! X-Plus just hit us with THREE knock-out announcements featuring two reissues and the all-new Frankenstein. Preorders are open for all three and they are all set to be released this June. Let’s run through all of the details in movie order. Click the photo or the more link to get all of the details. 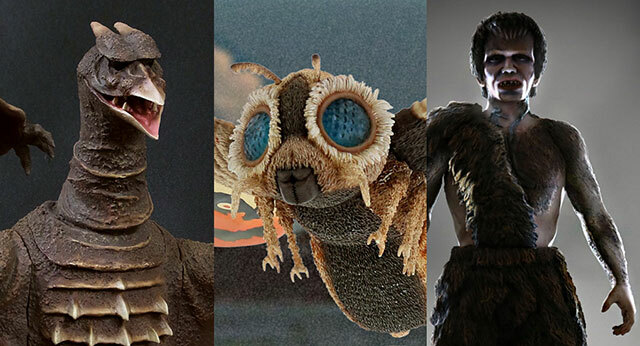 Rich Eso reviews the Toho 30cm Series Rodan 1964 (東宝30シリーズ 「ラドン（1964版）」) original release vinyl figure by X-Plus. This one, or course, pairs up with collector favorite, the 30cm Series Godzilla 1964. This Rodan was recently reissued in North America through Diamond in June of 2016. If Rich has you wanting one after watching this, go hunt one down NOW before they all disappear! 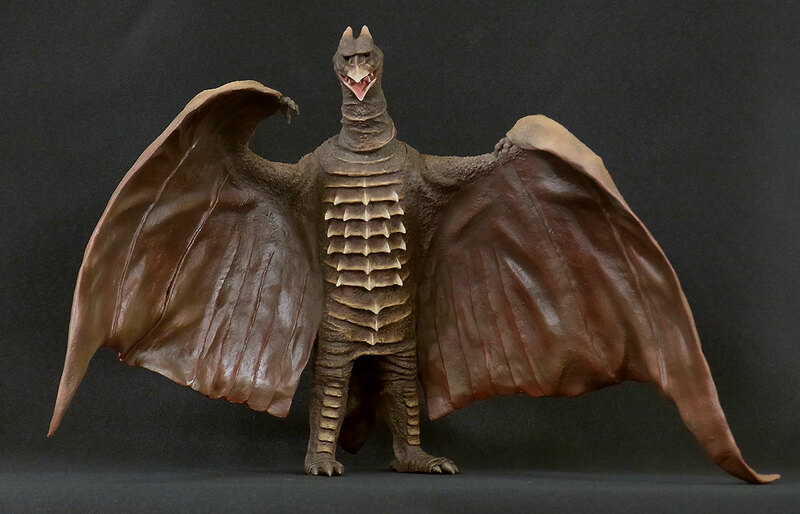 The Toho 30cm Series Rodan 1964 vinyl figure by X-Plus really does look like it literally flew out of the movie and onto your shelf. It’s based on Rodan’s second film appearance as seen in Ghidorah, The Three-Headed Monster, 三大怪獣　地球最大の決戦 (1964). 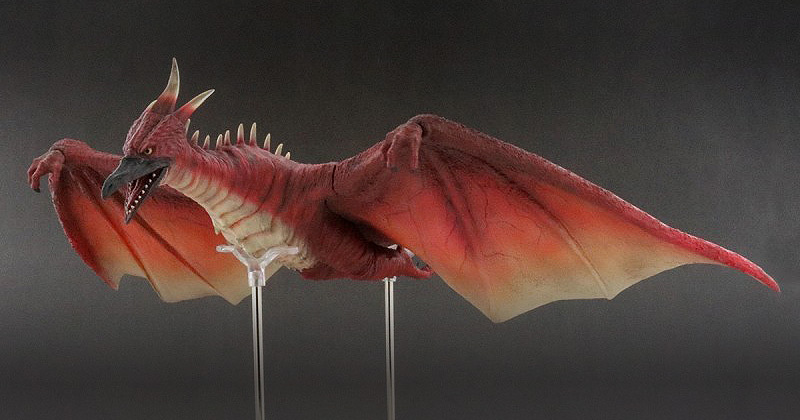 What makes this a monster of a figure is its nearly two-foot-long wingspan. It stands in perfect scale with his buddy, the Toho 30cm Series Godzilla 1964. And it is a marvel of sculpting, texture and paint. It was originally released in Japan way back in 2012. It was reissued for the North American market (through Diamond Distributors) in June 2016 as the Godzilla Kaiju 12in Series Rodan 1964 giving collectors who missed out another chance at grabbing this amazing vinyl. This review was made with the 2016 North American (Diamond) Reissue. Nick Adam, from The Monster Report unboxes the 30cm Series Rodan 1964 North American (Diamond) Reissue released in early 2016. This figure is still available. You can grab one from (through Flossie’s) for $149 or at your local comic store. See more of Nick’s video’s at his Youtube Channel: The Monster Report. Matt Jacobson, a.k.a. 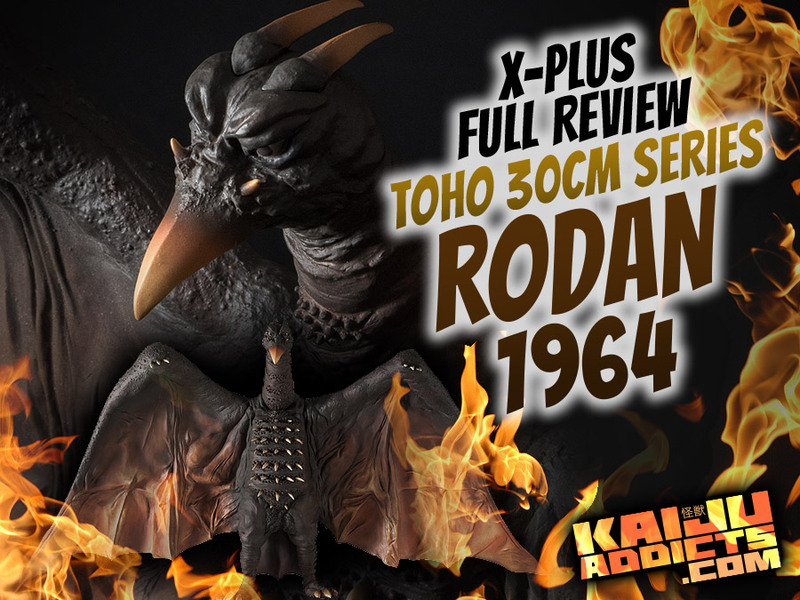 Gojira851 unboxes and reviews the Godzilla Kaiju 12in Series Rodan 1964, a North American reissue (Diamond) of the Toho 30cm Series Rodan 1964 vinyl figure by X-Plus. See more of his videos at Gojira851’s YouTube Channel. This is not a drill. Repeat: This is NOT a drill. Radar stations everywhere report a flying mass of giants objects approaching! Duck and cover! And clear a space on your shelf! 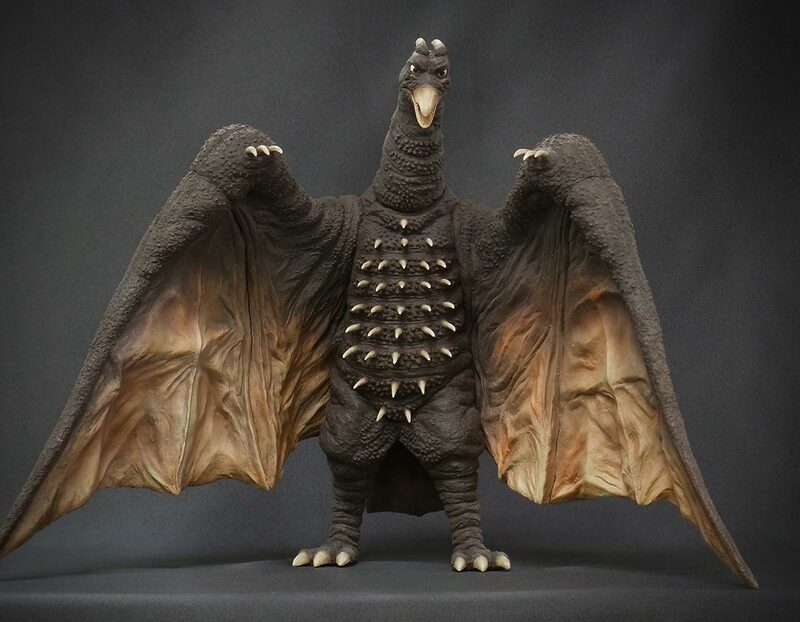 The Toho 30cm Series Rodan 1968 vinyl figure has been reborn as the Godzilla Kaiju 12in Series Rodan 1968 for North America thanks to a deal between X-Plus and Diamond Distributors. After an almost yearlong wait, this figure will start arriving on Wednesday, June 15. If you placed a pre-order, get ready to bug your comic store manager or your favorite online retailer for a status. Miss out? We have extras coming in at Flossie’s Gifts & Collectibles for only $149.